A mud volcano erupted in the suburb of Baku on February 6. The Azerbaijani Emergency Situations Ministry reported that it received information about the eruption of mud volcano in Sangachal settlement, the Garadagh district. “The incident was reported to the Department of Volcanology of the Azerbaijani National Academy of Sciences. Currently, a group of representatives of the Ministry are working at the site,” Spokesman to the Ministry Ogtay Bayramov said. Mud volcanoes are a fairly widespread geological phenomenon and over a thousand mud volcanoes are known to exist in the world. Eruption of mud volcanoes mainly are accompanied by strong explosions and underground rumble. Gasses come out from the deepest layers of the earth and immediately ignite. 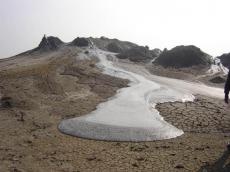 Azerbaijan is the first in the world by the number of mud volcanoes. 350 out of 800 mud volcanoes in the world are located here. Over 130 of these mud volcanoes are located in the country’s Caspian Sea section. Azerbaijan's rich fields of oil and gas condensate such as Lokbatan, Garadagh, Oil Rocks, and Mishovdag were discovered near mud volcanoes. The lava, mud, and liquid spewed by mud volcanoes are used as raw materials for chemical and construction industries, as well as pharmacology.